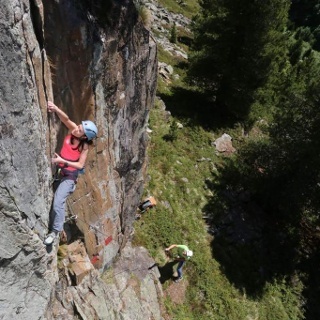 The climbing garden has mainly easy routes and is a good choice for climbing adventures with the whole family. It is beautifully located and can be combined with a scenic 20-minute walking tour. What's more, this climbing garden promises great fun for young and old. Right at the beginning - when you cross the suspension bridge - surefootedness and a good head for heights are absolutely required. 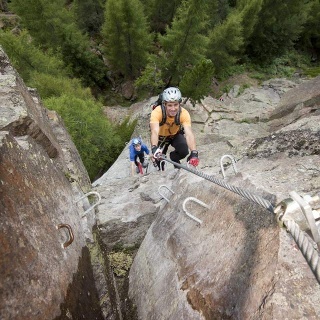 A steel rope for via ferrata sets is available as well. 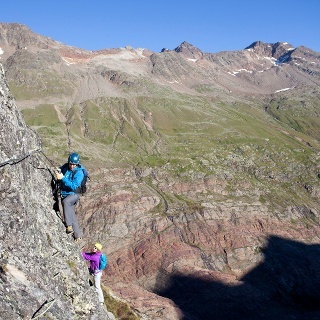 The family-friendly route features two difficult grade-C sections where previous via ferrata experience is recommended. Pleasant and easy walking trail to the access area, ideal also for onlookers who can watch the sportsmen close-by. 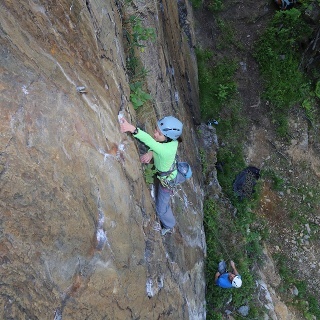 Equipment: helmet, harness and complete via ferrata climbing set, via ferrata gloves, appropriate climbing shoes. Via Ferrata basic knowledge is necessary.This via ferrata is graded B-C, most sections are of intermediate difficulty (B) and therefore also perfect for families with children over 10 years - if using an additional safety rope. Marked descent trail to Längenfeld, then continue in the direction of Astlehn; walking time: approx. 45 minutes.You can also get to the village of Burgstein by car. Leaving behind Sölden, you follow the federal road to Obergurgl for another 30 minutes. Then you follow the Zirbenwald stone pine forest trail to Davids Hütte where you find the access point. 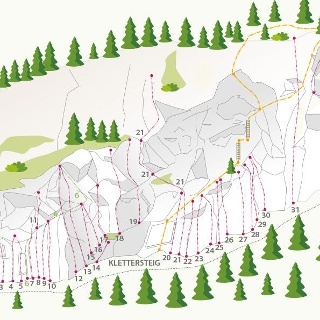 Car parks are available at the church (for a charge) or at the Festkogelbahn mountain gondola (for free).